Great rugged 4WD track riding through remote country in the heart of the Judbarra/Gregory National Park for those liking some solitude. A challenge for those who appreciate, and are prepared, for the really tough mountain bike stuff. Maybe two 4WDs a day traverse the track in the short time it’s open each year. Not many others out there at all. The ownership of the national park was returned to the aboriginal people and the park renamed in May 2010 but from 2021 it will be known as Judbarra. The park has been leased back to the government. Kalkarindji to Timber Creek, Northern Territory. 207km not including the 16km return Limestone Gorge side trip. All unsealed except for the last 10km into Timber Creek along the Victoria Highway. 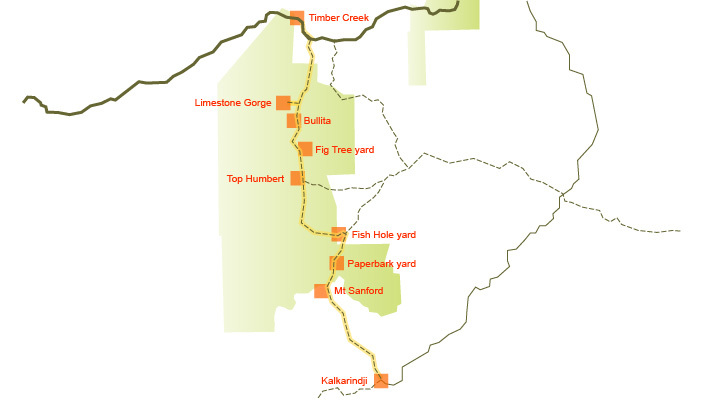 The Hema Kimberley map has a detailed insert map for the Jutpurra (Gregory) National Park which is not entirely accurate, ie the locations of the campsites are woolly. The Judbarra/Gregory National Park has a vague map that is misleading in critical places, like road junctions at Top Humbert Yard, where is that campsite, and Fish Hole Yard. Note some of the signage in the park is missing which can cause some confusion at T junctions. Allow 7 days riding to enjoy the remoteness. Top Humbert campsite is as good a place as any for a day off with the flowing Humbert River nearby. And Limestone Gorge if you have enough food left. mid-June to September. The track is closed for the rest of the year due to the Wet Season and problems with 4WDs hacking up the track. Check at the official Parks and Wildlife Commission NT website for the up to date information. Route through Judbarra/Gregory National Park in orange. Permanent water points shown. The road is sealed for the first 10km until the Mt Sanford homestead turnoff just before the Daguragu aboriginal settlement. The road into Mt Sanford is 2WD capable at a pinch, the hardest parts are stretches of gravel getting through the usually dry creek beds but it’s possible to make reasonable progress. On the southern boundary of the park the road changes into a little used 4WD track. When the track is opened for the season the grass between the wheel ruts is slashed to reduce the height of the Wet Season spear grass growth. The southern section, called the Gibbie Track, is the more difficult section to traverse but there are long smooth sections at times where progress can be reasonable. There’s a section of bare limestone rock for 10km north of the Broadarrow Track turnoff that is harsh on the tyres and short stretches of limestone surface occurs sporadically elsewhere. Generally there are many small dry streams with roundish boulders to drop in and out of. The 4WD track is generally slow going ie less than 9km/hour. The main Humbert River crossing is hard work with knee deep water and then across the broken rock but if a 4WD can do it and you’ve got this far it should be no worries. Once to Bullita homestead the road becomes 2WD capable. Yup, the fun is almost over. But not quite. The side trip down to Limestone Gorge is well worth the effort. Once the road finishes, the track down to the Limestone Gorge campsite is officially closed: well, the road has been washed out by the Wet Season floods once too often and while the track down looks ominous the dry river bed traverse is actually only about 320m long. The patience of negotiating the boulder infested track is rewarded with a great campsite that you will have to yourself. Not a major issue. Plenty of waterholes left over from the Wet Season. Fish swim in them all so the water can’t be too bad. All camping sites are near permanent waterholes. A community store at Kalkarindji and a couple of small stores at Timber Creek. Ain’t nuttin in between. Paid caravan parks at Kalkarindji, about $10pp and Timber Creek, ditto (2009) with shade, grass, hot showers and flush toilets. Timber Creek has a feed the freshwater crocs exhibition every day at 5pm. The remote designated campsites in Gregory are officially free and you get what you pay for: a slasher cut the grass over the area at the beginning of the season and a fireplace. No toilets, showers, or other facilities until you get to the very popular Bullita Homestead campground. (Then again you might prefer to trundle down to the otherwise inaccessible Limestone Gorge camp site. The sites are near waterholes. Dingo Yard is no longer maintained, and Fish Hole Yard is not sign posted, but the others are pleasant and won’t be overcrowded. For those used to Purnululu or Kakadu National Parks the tourist attractions are a little underwhelming. Umm, there’s a walk to Police Creek waterhole through Boab trees to find 1000s of screaming Little corellas. A couple of lookouts. The reason it was gazetted as a national park becomes more obvious when you hit the Limestone Gorge area. There’s a few interesting walks around with the highlight 550 million year old stromatolite fossils on display, (bacterial colonies, one of the earliest forms of complex life). Otherwise the joy is the journey. It’s an often rugged 150km of track that most 4WDs think is too tough. Very harsh on the tyres and bike frame generally. You are on your own out here. This would be one of the least travelled 4WD tracks in Australia so be prepared. If you are the nervous type you could always pack a satellite phone or EPIRB to let others know you are in trouble. Ain’t so many who have written about this particular route but my blog from my own travels starts here: Black Gin Camp, Mt Sanford Station: and I meet the local reptiles.